This article is derived from NIST Special Publication 800-181 Dated August 2017. See SP 800-181. The National Initiative for Cybersecurity Education (NICE) Cybersecurity Workforce Framework or NICE Framework provides a fundamental reference resource for describing and sharing information about cybersecurity work roles, the discrete tasks performed by staff within those roles, and the knowledge, skills, and abilities (KSAs) needed to complete the tasks successfully. The NICE Framework Components includes 7 Categories, each containing Specialty Areas. 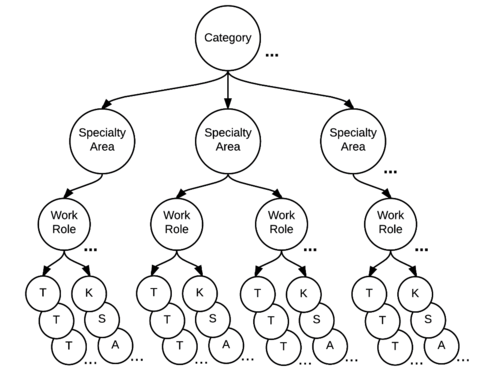 These Specialty Areas have their own definitions, Work Roles, and Work Role definitions. The Work Roles each require different KSAs and defined Tasks. This page was last modified on 29 November 2017, at 21:51.